In cardiac excitation-contraction coupling (ECC), calcium enters the cytosol via L-type Ca2+ channels (LTCC) and reverse Na+/Ca2+-exchange (NCXrev), or is released from the sarcoplasmic reticulum (SR) by Ca2+-induced Ca2+-release (CICR). The magnitude of Ca2+ influx via the different pathways varies with the state of the cell and is difficult to assess quantitatively, because changes in Ca2+ influx through one pathway affect the others. In rainbow trout ventricular myocytes, the role of the SR has been uncertain for decades. The aim of this work was therefore two-fold: 1) to develop a method to quantify the Ca2+ influx pathways, and 2) to determine the role of CICR from the SR in trout ventricular myocytes. The novelty of our developed method lies in the mathematical analysis of measured transsarcolemmal Ca2+ currents and their impact on the corresponding Ca2+ transient during gradual inhibition of the currents in action potential (AP) clamp. We tested the developed method using an excitation-contraction model and showed that the method was able to recover calcium fluxes from noisy synthetic data. We applied the approach to trout ventricular myocytes and quantified the relative contributions of different Ca2+ influx pathways in ECC and determined the kinetics of these fluxes. Under baseline conditions, NCXrev is the main transmembrane Ca2+ influx pathway contributing 29 ± 6% (of the Ca2+ influx), LTCC 18 ± 7%, and CICR 53 ± 10% to overall Ca2+ transient. Thus, NCXrev is an important regulator of contractility and probably plays a role in the negative force-frequency relationship of trout ventricular preparations. These results demonstrate that trout and neonatal mammalian cardiomyocytes resemble each other not only in terms of morphology and energetics but ECC as well. 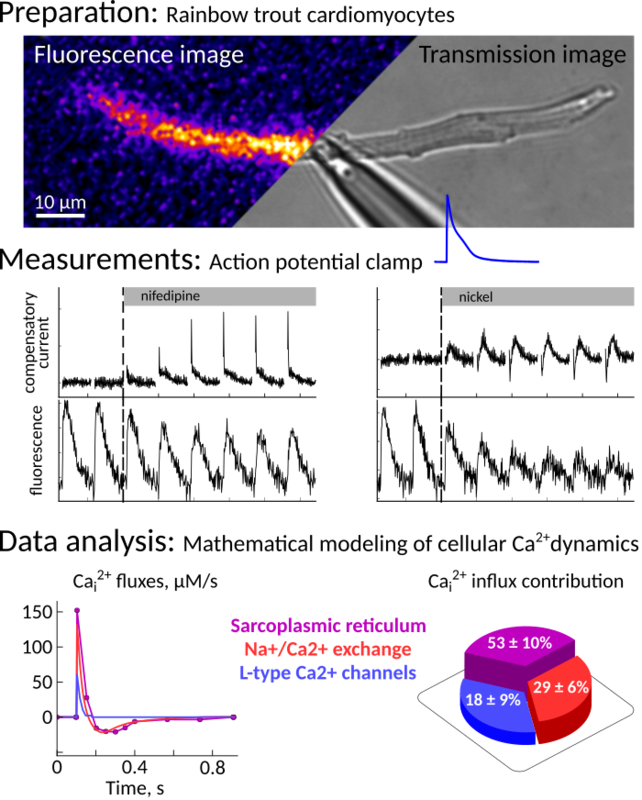 In summary, the developed method resolves the major problem how to separate highly interconnected fluxes in AP clamp and allows to study Ca2+ fluxes in cardiomyocytes under conditions close to in vivo.